Jonathan Pollard was one of the worst traitors of the 20th century: He deserved his 30-year prison sentence. Jonathan Pollard was one of the worst traitors of the 20th century. He deserved to languish as long as he did. 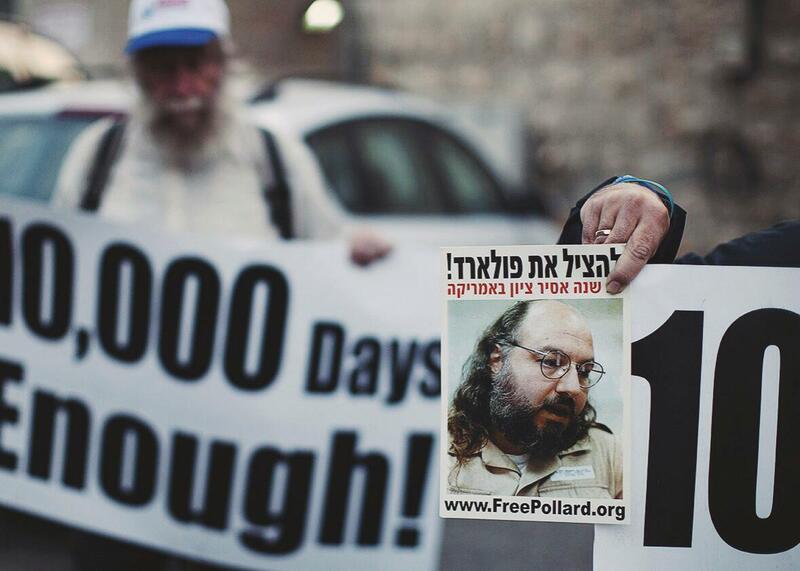 Protesters call for the release of Jonathan Pollard (pictured on the flier), who has been in prison for 30 years on charges of spying on the United States, during a demonstration outside U.S. Secretary of State John Kerry’s hotel in Jerusalem on April 8, 2013. Jonathan Pollard, who’s been in prison the past 30 years for selling secrets to Israel, will be released on parole this November. Two things are worth noting. First, contrary to many skeptics, his release is not a political ploy to relax Israel’s opposition to the Iran nuclear deal. Second, contrary to claims by Pollard’s supporters, his punishment has been completely justified; he ranks as one of the 20th century’s most appalling American spies. The first myth is easy to puncture. Pollard’s life sentence came with a mandatory-parole clause after 30 years. He started serving time in November 1985. So, 30 years is up in November 2015. It’s math. The second myth takes longer to unravel. At his sentencing hearing, Pollard, who’d been a U.S. Navy intelligence official, painted himself as a devout Jew who’d stolen classified documents dealing only with Arab military might in order to help Israel stave off an invasion; none of his actions, he claimed, harmed American security. Judge Aubrey Robinson Jr. called Pollard to the bench, showed him a classified affidavit that the Department of Defense had submitted, listing the range of sensitive secrets that he’d stolen, pointed to one of the items, and said, “What about this?” Pollard was silenced. Robinson sentenced him to life. We now know (and M.E. Bowman, a senior counterintelligence officer who was working the Pollard case, has since confirmed) that the item in question was a National Security Agency manual called the RASIN, short for “Radio Signal Notations.” The RASIN was a guide to the physical parameters of every radio signal that the NSA was intercepting—a guide on how the NSA was tracking military communications, not just Israel’s but any and every country’s, including the Soviet Union’s. The RASIN was 10 volumes, and Pollard gave his Israeli handlers every single page of it. An article by Seymour Hersh, in the Jan. 18, 1999, issue of the New Yorker, titled “The Traitor,” listed some other beyond-top-secret documents—among the tens of thousands—that Pollard had stolen and sold. They included the “National SIGINT Requirements List” (SIGINT standing for Signals Intelligence), which revealed which communications channels of which military powers, in which regions, the NSA was intercepting in what order of priority. In other words, it would give the reader a heads up on where and what actions the U.S. military might take next. Pollard also provided a year’s worth of memos by intelligence officers in the U.S. Navy’s 6th Fleet, recording all their observations of Soviet planes, ships, and submarines in the Mediterranean Sea. He provided documents on how Navy intelligence was tracking Soviet submarines. He provided material revealing that one of America’s most highly classified photo-reconnaissance satellites could take pictures not just straight down but from an angle: Israeli or Russian or some other country’s officers might think they could take a missile out of hiding once the satellite passed over, but no, the satellite was still snapping pictures—and now, thanks to Pollard, they knew this, too. In other words, much of this material would be of use to more countries than just Israel. And Hersh quoted senior U.S. intelligence officials saying that some of these documents made their way to Moscow, perhaps through a KGB mole in Mossad (who was also later arrested), perhaps by Israeli officials who gave the Soviet Union the documents in exchange for letting more Jews emigrate to Israel. Officials have told me, in the years since, that they suspected such an exchange but never found hard evidence. Nonetheless, senior officials told Hersh that Pollard’s handlers had asked him to get certain types of documents that seemed of little use to Israel but of great value to the Soviet Union. Many of Hersh’s sources on the story were veteran intelligence officials who were worried that President Bill Clinton was about to free Pollard—a move that, they thought, would be dangerous to national security (Pollard was thought to carry many more secrets in his head) and a severe blow to morale within the agencies. So they gave Hersh a lot of material—much more than anyone had yet made public—on what Pollard had done. Furthermore, the admirals wrote, Pollard was well-paid for his efforts—a monthly stipend of $2,500, more than $10,000 in gifts, and other favors, in exchange for a commitment to spy for 10 years—and he was asking his handlers for a raise when he got caught. An official investigation revealed that Pollard was constantly broke, in serious debt, borrowing money from colleagues, and spending it just as fast. Just a few months after Pollard went to work for a secret unit of U.S. Naval Intelligence, he was approached by an Israeli air force officer, and the arrangement began. Finally, the admirals wrote, Pollard was lying when he said that he’d taken only documents that would help Israel defend itself from Arab countries. In fact, he stole entire databases, “suitcase-loads” of documents that he couldn’t have had time to examine before delivering them to his handlers, often on a nightly basis. Many of these documents, they added, had nothing to do with Israel or the Middle East. There is another disturbing element to this story. For more than 12 years after his arrest, senior Israeli officials told their American allies that Pollard had been a “rogue” who had no contact with the Israeli government. Finally, in 1998, Prime Minister Benjamin Netanyahu admitted to President Clinton that Pollard had been an Israeli agent all along, handled by senior officials in the Bureau of Scientific Relations. Around the time the admirals wrote their op-ed and intelligence officials were telling Hersh all about Pollard, Bill Clinton was thinking seriously about letting the spy go. Israeli leaders and many Jewish activists had been leading a “Free Pollard” campaign for years. Clinton figured that if he gave in to the pressure, he could get Netanyahu to sign an Israeli-Palestinian peace accord. However, CIA Director George Tenet, alerted to the possibility, told Clinton that he would resign in protest if Pollard were freed. Seven former secretaries of defense signed a letter opposing a pardon as well. Clinton told Netanyahu there was no chance that Pollard would be released soon. Every few years, a story appears that the president—be it Clinton, Bush, or now Obama—is considering, or has agreed to sign, a Pollard pardon. All of the stories have been false. The latest round is false, too. When he leaves prison, his movements will be restricted; it’s a parole, not a pardon. More to the point, he’ll be leaving prison not because he’s a hero, a martyr, or a victim of injustice—he is none of those things—but rather, simply, because his time is up.